Note to visitors in 2012: We've just submitted a manuscript to Science reporting the results of our unsuccessful attempt to replicate the key findings of this work. The manuscript will be publicly available on the arXiv server beginning Feb. 1 2012. Note to new readers: I wrote this post on Saturday Dec. 4, mainly to clarify my own thinking. I didn't expect anyone other than a few researchers to ever read it. Since then I've made a few minor corrections and clarifications (typos, decimal places, cells not cfu), but I haven't changed anything significant. Please read the comments - they contain a lot of good scientific thinking by other researchers. Here's a detailed review of the new paper from NASA claiming to have isolated a bacterium that substitutes arsenic for phosphorus on its macromolecules and metabolites. (Wolfe-Simon et al. 2010, A Bacterium That Can Grow by Using Arsenic Instead of Phosphorus.) NASA's shameful analysis of the alleged bacteria in the Mars meteorite made me very suspicious of their microbiology, an attitude that's only strengthened by my reading of this paper. Basically, it doesn't present ANY convincing evidence that arsenic has been incorporated into DNA (or any other biological molecule). What did the authors actually do? They took sediment from Mono Lake in California, a very salty and alkaline lake containing 88 mg of phosphate and 17 mg of arsenic per liter. They put the sediment into a similarly alkaline and hypersaline defined medium containing 10 mM glucose as a carbon source, 0.8 mM NH4SO4 as a nitrogen and sulfur source, and a full assortment of the vitamins and trace minerals that might be needed for bacterial growth. Although this basic medium had no added phosphate or arsenate, contamination of the ingredients caused it to contain about 3 µM phosphate (PO4) and about 0.3 µM arsenate (AsO4). For bacterial growth it was supplemented with arsenate or phosphate at various concentrations. The interesting results came from sediment originally diluted into medium supplemented with the highest arsenate concentration they initially tried (5 mM) but no phosphate. Over the course of several months they did seven tenfold dilutions; in the sixth one they saw a gradual turbidity increase suggesting that bacteria were growing at a rate of about 0.1 per day. I think this means that the bacteria were doubling about every 10 days (no, every 7 days - corrected by an anonymous commenter). After one more tenfold dilution they put some of the culture onto an agar plate made with the same medium; at least one colony grew, which they then inoculated into the same defined medium with 5 mM arsenate. They gradually increased the arsenate to 40 mM (Mono Lake water contains 200 µM arsenate). Descendants of these cells eventually grew in 40 mM arsenate, with about one doubling every two days. They grew faster if the arsenate was replaced by1.5 mM phosphate but grew only about threefold if neither supplement was provided (Fig. 1 A and B, below). The authors misleadingly claim that the cells didn't grow at all with no supplements. Under the microscope the bacteria grown with arsenate and no added phosphate (Fig. 1 C) look like plump little corn kernels, about 1 µm across and 2 µm long. They contain many structures (Fig. 1 E) which the authors think may be granules of the wax-like carbon/energy storage material polyhydroxybutyrate (PHB). Many bacterial cells produce BHP when their carbon/energy supply is good but other nutrients needed for growth are in short supply. Cells grown with phosphate and no added arsenate are thinner and lack the granules (Fig. 1 D). The authors used 16S rRNA sequencing to identify this bacterium as belonging to the genus Halomonas, a member of the gammaproteobacterial order Oceanospirillales. Members of this group are diverse but not known to have any uniquely dramatic features. According to an interview with the first author, this research was motivated by a desire to show that organisms could use arsenic in place of phosphorus. The two atoms have very similar chemical properties, but bonds with arsenic are known to be much less stable than those with phosphate, so most researchers think that biological molecules containing arsenic rather than phosphorus would be too unstable to support life. Thus the authors wanted to show that the bacteria had incorporated the arsenic in places where phosphorus would normally be found. They used several methods, each involving a low-tech preparation of cell material and a high-tech identification of the atoms present in the material. First they collected the bacteria by centrifugation, washed them well, and precisely measured the fraction of arsenic and phosphorus (as ppb dry weight, Tables 1 and S1). Cells given only the arsenate supplement contained about 10-fold more arsenic than phosphorus (0.2% arsenic and 0.02% phosphorus) and cells given only the phosphate supplement had 0.5% phosphorus and only 0.001% arsenic. The authors argue that the arsenate-grown cells don't contain enough phosphorus to support life. They say that typical heterotrophic bacteria require 1-3% P to support life, but this isn't true. These numbers are just the amounts found in E. coli cells grown in medium with abundant phosphate. They are very unlikely to apply to bacteria growing very slowly under phosphate limitation, and aren't even true of their own phosphate-grown bacteria (0.5% P). The large amount of PHB in the arsenate-grown cells would have skewed this comparison - PHB granules are mainly carbon with no water, and in other species can be as much as 90% of the dry weight of the cells. Thus their presence only in arsenate-grown cells could depress these cells' apparent phosphate concentration by as much as 10-fold. The authors then grew some cells with radioactive arsenate (73-As) and no added phosphate, washed and dissolved them, and used extraction with phenol and phenol:chloroform to separate the major macromolecules. The protein fraction at the interface between the organic and aqueous phases had about 10% of the arsenic label but, because the interface material is typically contaminated with liquid from the aqueous phase, this is not good evidence that the cells' protein contained covalently-bound arsenate in place of phosphorus. About 75% of the arsenic label was in the aqueous (upper) fraction. The authors describe this fraction as DNA/RNA, but it also contains most of the small water-soluble molecules of the cell, so its high arsenic content is not evidence that the DNA and RNA contain arsenic in place of phosphorus. The authors use very indirect evidence to argue that the distribution of arsenic mirrors that expected for phosphate, but this argument depends on so many assumptions that it should be ignored. They especially wanted to show that the cells' DNA contained arsenic in place of phosphorus, so they gel-purified chromosomal DNA from cells grown with arsenate (lane 2) or with phosphate (lane 3), and measured the ratio of arsenic to carbon by mass spectrometry. The numbers at the bottom give these ratios (the legend says 'multiplied by 10^-6 but they surely mean 'multiplied by 10^6'). As expected, this ratio was very low for the phosphate-grown cells (6.9x10^-6), but it was only twofold higher for the arsenate-grown cells (13.4x10^-6). Normal DNA has one phosphorus atom for each ten carbons (P:C = 10^-1), so the arsenate-grown ratio is only about one arsenic atom per 10,000 phosphorus atoms (i.e. one per 5 kb of double-stranded DNA). A 2x10^6 bp genome would contain 4x10^6 atoms of phosphorus, so if all this arsenate was really covalently in the DNA, each genome would only contain about 400 atoms of arsenic. And a phosphate-grown genome would contain 200! Could 400 atoms of arsenate per genome be due to carryover of the arsenate in the phenol-chloroform supernatant rather than to covalent incorporation of As in DNA? The Methods describes a standard ethanol precipitation with no washing (and no column purification which would have included washing), so I think some arsenate could easily have been carried over with the DNA, especially if it is not very soluble in 70% ethanol. Would this arsenate have left the DNA during the gel purification? Maybe not - the methods don't say that the DNA was purified away from the agarose gel matrix before being analyzed. This step is certainly standard, but if it was omitted then any contaminating arsenic might have been carried over into the elemental analysis. Finally, the authors examined the chemical environment (neighbouring atoms and bonds) of the arsenic in the cells using synchrotron X-ray studies. This is over my head, but they seem to be trying to interpret the signal as indicating that the environment of the arsenic is similar to that of phosphorus in normal DNA. But the cellular arsenic being in DNA can't be the explanation, because their DNA analysis indicated that very little of the cellular arsenic purifies with the DNA. The cells contained 0.19% arsenic (1.9x10^6 ppb), but the DNA only contained 27 ppb arsenic. There's a difference between controls done to genuinely test your hypothesis and those done when you just want to show that your hypothesis is true. The authors have done some of the latter, but not the former. They should have mixed pregrown E. coli or other cells with the arsenate supplemented medium and then done the same purifications. They should have thoroughly washed their DNA preps (a column cleanup is ridiculously easy), and maybe incubated it with phosphate buffer to displace any associated arsenate before doing the elemental analysis. They should have mixed E. coli DNA with arsenate and then gel-purified it. They should have tested whether their arsenic-containing DNA could be used as a template by normal DNA polymerases. They should have noticed all the discrepancies in their data and done experiments to find the causes. Well done Rosie. You should have send this to Science. organic-inorganic coevolution.It almost strengthens it…. by an organism is not new however.Some organisms substitute selenium for sulpher into an organic structure when selenium is unavailable,as just one example. I agree. This should be a letter, immediately. I agree, must send this to Science NOW!!!! Thanks for the community approbation. I'm composing my letter to the Editor now. glucose, acetyl-CoA) as well as arsenylated proteins where arsenate would substitute for phosphate at serine, tyrosine and threonine residues (1, 11) (table S3)." It seems pure speculation that the arsenic is in the biomolecules. Thanks so much for such a detailed analysis. I hope it gets a lot of attention, esp after all the media hype over this. Rosie, this is a terrific dissection and I concur with the others that it should be a letter to Science. I couldn't understand the basis for the calculation of the As:P ratio in Table 1 where the ten-fold difference in the As+/P- medium was represented as 7.3 - based on % dry weight but I can't get 7.3 to come out if I expressed the difference in molar units. It's really valuable to have a microbiologist take this paper apart. Yet another example of why science blogs are so important and why scientists should blog. Thanks so much. After seeing your comment at Pharyngula, I've been hoping for this post. I did a couple of posts last week, and have added a post today linking this one, titled: "Rosie Redfield kicks As!" I wrote "I think" because I can never remember how to do the exponential calculation and didn't want to take the time to look it up. I've made the correction and credited you. It's probably good practice to not trust any of my numbers if you're willing to take the time to check them yourself. Other than the linear vs. log scale in Fig. 1A, another minor thing that I can't explain is why in Fig. 2B they use different magnification scale. My impression is that AsO4-grown cells weren't dividing (enough?) so they showed a single cell filling the space vs. a dividing cell in the PO4-grown culture. Regarding your calculation of PO4 in DNA/RNA. I was discussing this with Forest Rohwer at SDSU and he thinks that a lot of PO4 in the cell would be in phospholipids/membranes; another reason to think there is plenty of PO4 in the media from dead cells! Hi. I have posted on many places, they should not be doing standard DNA preps and the experiment we need to see is to see a caesium chloride density gradient ultracentrifugation (not a gel). This is a very classic, "old school" experiment that isn't particularly hard, but very much forgotten in the quick "kit-ified" speed-and-convenience culture of contemporary biology. If indeed the DNA has arsenic, it should be getting denser and we would see that as a band shift. Ethidium bromide's mode of action would not be affected by arsenic substition. Typical growth curves use log (live bacteria) or linear OD on the y-axes, so that's not so strange. If you graph the number of live bacteria over time, you typically get an unwieldy exponential curve, but taking the log of the live cell number typically gives you a linear curve. And I agree with ChemDroid, the same technique Messelson & Stahl used to prove that DNA replication was semiconservative. As-containing DNA should be more dense in an EtBr-Cs gradient, and that would be obvious. I couldn't read past "...it don't present ANY convincing evidence..." How do you expect anyone to take you seriously if you can't even write in proper English? I can't be convinced that you have any idea what you're talking about. But how do you expect anyone to take YOU seriously if you can't even write your name? Poor writing aside, I'm not sure 'water soluble compounds' would partition into the nonpolar 'supernatant.' Actually I know they wouldn't. As for a letter to the editor, I strongly suggest you insert references in your work that support (or at least demonstrate precedence) all claims regarding cellular concentrations. @Prof Fancy Pants: In these extractions the phenol or phenol:chloroform phase is denser than the aqueous phase, so most water-soluble molecules partition into the supernatant. Thanks for the advice about my letter to the editor. 1. Yes, one of the Anonymoi (wouldn't that be the plural?) is right; find that "it don't" early in the post and make it "it doesn't." Anyone who blogs seriously knows how hard it is to proof our own content, for one thing, and on screen, for another. Typos that create a splash on the printed page somehow fit smoothly into the stream of thought when viewed on screen. 2. ChemDroid is dead-on about the cesium chloride/ethidium bromide ultracentrifugation. And they wouldn't even have to wash the samples in advance — the centrifugation would resolve the As-DNA (if present) from the impurities. 3. I especially like your answer to the Anonymous who pointed out the error in your estimation of exponential growth: Check all my calculations! After all, that is the essence of science. You have described your methods — in this case, basically thinking through various scenarios and coming up with plausible alternative explanations and ways to test them. Some of those tests involved math, so you did them. And any thinking scientist, when invited into such a discussion, takes nothing at face value — they repeat the calculation themselves, even if only in their head. They think through the same scenarios as you explain them and then see if they come to the same conclusions you come to. And then they join the discussion accordingly, either affirming your ideas or presenting their own. Science isn't about grammar or grants or lectures or stature — it's about data, conceiving ways to obtain that data, drawing and testing inferences and conclusions from that data, looking for ways to test those inferences and conclusions, and, when we feel that we have done enough testing, using our brains to determine which set of inferences and conclusions is the most reasonable, all things considered. And when someone else steps up and says, "But you lost a decimal place when you flipped the napkin," we double-check the calculation and, if they were right, thank them for setting us back aright. And you made that point so succinctly — "Check my math." Fantastic commentary. The data for the key conclusion of the paper (that As can be incorporated into DNA as a P substitute) is just not there. In a NYTs article, Gerald Joyce was quoted as saying they didn't have the "smoking gun" evidence yet, which I think is quite a charitable take on their data (they are not even close to a smoking gun!). Seems like you'd want the smoking gun evidence for a Science article which such bold claims, no? I'm with ChemDroid on CsCl, but add that they should have used CsCl gradients prior to their mass spec analysis. Anyway, the levels of As reported (as per Rosie's excellent analysis) are too small to get all Science-Article-News-Conference-y about. Sorry, your language confused me. The supernatant is the liquid part when there is solid left behind. If there is a biphasic supernatant, then you would refer to the phase where the compounds are present, meaning aqueous-phase, etc. I'll join the chorus of support, but with one caveat: I think you let the reviewers off too easily. That a negative review *might* have been overruled by the editors is no excuse for letting a bad paper slide. Losing a "high impact" publication may be bad, but publishing a paper that turns out to be Cold Fusion with DNA is much, much worse. Prof fancy pants is correct; I was misusing the term 'supernatant'. The authors used it in their Supplementary Materials, but in the paper they refer to it as the 'DNA/RNA' fraction. You should have had a full stop after the second set of quotation marks, as that's the end of your first sentence. Punctuation within quotes is, of course, part of the quoted text and not part of the quoting author's. How can I take your criticism seriously when you make an elementary mistake like that? Clearly the anon poster(s) is/are petty little pedants who are clearly enamored of authority derived from one's ability to write a quick post that is completely error free. The arguments don't matter. If there is a small inconsequential error (like a quick and dirty estimation of a log growth time) or a typo, then the person/troll will question the rest of the argument. Clearly that person/troll doesn't have the expertise to actually critique the argument. So that person relies on some bs argument from authority ("How can I trust X if you can't Y? Because I must trust X due to my inability to evaluate the argument for myself.") The argument by Rosie is clear enough that pedantry adds literally nothing scientifically. That being said, I'm going to be a little pedantic myself. @ Neuroskeptic, the petty little pedant actually got the quoting correctly according to most manuals of style I'm familiar with. (Or "with which I'm familiar".) Not that this is important, but we should be careful before rolling in the muck in the pedantry sty. It is enough that anonymous can't formulate a counter-argument. Scoring points for hypocritical pedantry should only be used as bonus points once the pedant is skewered by its own weak argument. And a few other things... Given that Rosie cites, and I quote "a growth rate of about 0.1 per day", then your comment about 7 days presumes a false amount of precision given Rosie's ballpark figure. For example, a rate of 0.08 / day would yield a result of closer to 9 days ( log(2)/log(1.08) ). And, incidentally, your rate would actually be ~7.27 days. Or, expressed precisely log(2)/log(1.1). Given that nothing crucial hinges scientifically on whether the growth rate was 7 days or 10 days and given that 0.1 may not be a very precise number, your degrading comment is not constructive. Why don't you pause before making such comments? I only skimmed the comments so someone may have brought these things up, but in case they haven't, I have a couple corrections for you and some comments that may strengthen to your case. The authors measure OD at 680 nm, not 600 nm. They do not say way, but I assume it's because they did a scan of the culture in stationary phase and found a peak at 680, or because they had other things in the culture that contributed background absorbance at 600 nm. I agree with your critiques of their growth data and wonder if the increase in turbidity that they saw was actually precipitation of some mineral rather than increase in cell number (unfortunately I don't know enough about the chemistry of arsenic and other things at high pH to be able to suggest what mineral that would be, but I know that at least some products of arsenic metabolism are insoluble at neutral pH, anyway). The other point I wanted to make is that they don't measure cfu's: their cell number approximation is based on acridine orange staining and counting by microscopy. I am currently looking into whether intracellular PHB accumulation increases AO staining. I have a hunch that it does, and that the increase they saw was actually a better ability to detect cells due to their high PHB content. They SHOULD have done cfu counts and protein measurements. Since the cells were "unstable," I bet cfu counts wouldn't have worked, or at least wouldn't have correlated with the increase in OD that they saw. I don't know why they didn't do protein measurements. But I wish the reviewers had asked for these things! Although this is a totally side topic, punctuation within quotes is a US/UK variant. Most US standard English styles prefer putting the punctuation within quotes, even if it's not in the original quoted statement. Some journalistic styles are an exception. Brilliant analysis, as others have said. However, there is one point that hasn't been made in any of the comments I have read. Although these six elements make up nucleic acids, proteins and lipids, and thus the bulk of living matter, it is theoretically possible that some other elements in the periodic table could serve the same functions. It is certainly true that these six elements make up nucleic acids, (most) proteins and lipids, but the implication that this means that the bulk of living matter consists of them follows from this is nonsense. The conclusion is true, but the claim that it follows from the premise is not, because the bulk of living matter is not nucleic acid, protein or lipid, but carbohydrate (and water, if we want to count it). This may of course be just a bit of careless writing, but it may alternatively suggest serious gaps in the authors' knowledge of elementary biochemistry. Another thing that surprised me is that their added salts were contaminated with phosphate. Why? Surely scientists with the resources of NASA behind them can afford to buy salts that don't contain phosphate? @Athel Cornish-Bowden, thank you for your well written, insightful and entertaining book 'Fundamentals of Enzyme Kinetics.' Entertaining and Kinetics have probably never been mentioned before in the same sentence. My own research in to this field shows that if I leave a raspberry jam sandwich in my car then bacteria will eat it provided the dog doesn't get to it first. This proves to me that if bacteria have a packed lunch they'll do just fine in pretty much any environment. I am sure NASA will agree. Although my work is not exhaustive or conclusive and may lack some of the more frivolous elements of scientific methodology, all the mathematics and spelling contained in it is correct (I make no claims for grammar). I demand therefore to be taken seriously. First, why are the boxed bands in lanes 2 and 3 migrating differently? Surely this isn't a consequence of the proposed 1:10,000 substitution of Pi with As? Why does the +Pi lane 3 have two extra bands that lane 2 does not? Aren't the samples suppose to be the same except for +/- As? Finally, is the As:C ratio reported for lane 3 the background noise level since this sample should contain no As - not even contaminating? So the +As lane 2 sample is less than 2-fold above the noise? That would be concerning. Also, on a side note: For arsenate monoester hydrolysis I've seen a half life of 30 minutes reported in water. Granted, the aresenate diesters needed for DNA might be more stable (as phosphate diesters are about 100-fold more stable than monoesters); however, to build DNA from ATP, the cell would have to at some point be dealing with an arsenate monoester to get a molecule of arsenate in the alpha position of ATP. I think this is unlikely given the half life reported in water. Did I miss a discussion of how the authors think the conditions allow for drastically more stable arsenate monoesters to form? Any model of arsenate being covalently attached to biologically relevant macromolecules would require an explanation or at least some testable speculation of how arsenate esters are being stabilized. I confess that I did not understand a great deal of this article, though I am inclined to agree with the commenters who said it was poorly prepared. Fortunately, it looks as though many of the typos have been corrected. I agree with commenter who said that printing an article with typos in no way impeaches this scientific quality of the article. I was very concerned, however, with the remark, "OD600 is plotted on a linear scale and cfu/ml on a log scale (is this a shabby trick to increase their superficial similarity?)." In fact, optical density, or OD, is a logarithmic unit, so it would have been improper to plot it on anything but a linear scale. The authors, as far as I can tell, were not employing a trick of any kind when they plotted those 2 figures, and I thought that accusing them of trickery was way out of line. The relation between growth rate and doubling time, by the way, is given by something called Rule 72: the product of growth rate and doubling time equals 72. I wanted to add something I noticed in the reading of this Science paper, which is along the same lines as others who have commented on their lack of cleanup in the preparation of protein and DNA extracts. Namely, that they did nothing to remove the poly-hydroxybutyrate that is - in my understanding as a biochemist - used by this organism to sequester toxins (like Arsenic) into the vacuoles shown in this paper. Any poly-hydroxybutyrate carried along will have chelated significant amoutns of Arsenic, and since the polymer can vary so much in chain length, it would make sense that it be present in both the protein and DNA/RNA fractions to varying degrees. As well, my own big criticism as a biochemist of this paper is a lack of comparative mass-spec data of known phospho/arseno-proteins (which could easily be acquired via antibodies to known proteins, given this organism's close relation to E. coli) and DNA/RNA digestions/hydrolysis followed by a quick flight in a Mass Spec and compared with DNA/RNA from the same organism grown in phosphate-only media - simple experiments that would only take a few weeks at most to verify these claims. Their X-ray data is about the strongest evidence they have in this paper, but given the lack of previous EXAFS data on arsenic-based biomolecules, drawing a conclusion from the bond lengths they find from a whole cell extract is really not any basis for proof of the statements they make about arsenylated proteins and small molecules/DNA/RNA. In regards to the EXAFS: I'm not an expert but as others said this might be the closest they get to trying to make a physical measurement of covalently attached arsenate. However, the bond length differences between arsenate and phosphate esters (P(As)-O) is ~0.1 A. I highly doubt that the resolution of the EXAFS measurements could resolve this difference - especially when the EXAFS was done on whole cell extracts?!? Again, as others mentioned a physical measurement of covalently attached arsenate would be best done with MS. Or maybe a high res. neutron structure. Matt, does it matter that, for bacterial cultures, what's being measured is light scattering, not true absorbance? I've never before thought about the 'absorbance is a log property' issue you raise, but when I plot the A600 readings for an exponentially growing culture, I only get a straight line if I put it on a log scale (just as with cfu measurements). Bryant, I think they say that the 'vacuoles' (probably really granules of PHB) tended to break up (or break free) during cell pelletting and washing? That was a reason they gave for the high variability of some measurements. I didn't know that PHB would chelate arsenic - that's certainly another reason to distrust their data. Excellent post! You're now mentioned in the "Skepticism" section in the Wikipedia article on GFAJ-1‎‎. Logan, the boxed bands of chromosomal DNA are probably migrating differently for two reasons. The DNA from the phosphate-grown cells has the very long fragment length typical of chromosomal DNA that's been gently purified. This causes it to migrate slower and form that trailing smear. The arsenate-grown DNA is more fragmented, so it forms a straighter band in the gel, with much less smearing. The two lower bands in lane 3 are ribosomal RNA (very abundant in cells). Their high concentration overloads the capacity of the agarose; this is why they form such messy smears, and may also contribute to the smeariness of the chromosomal DNA in this lane. I don't know why there's no rRNA in lane 2. The authors don't mention this, but their analysis (Table S2) has the RNA values for the phosphate lane but not for the arsenate lane, so either this was the only gel they analyzed or the absence of rRNA from this sample was reproducible. Finally, you're right about the background level of arsenic in the gel. The values in Table S2 for the gel 'blank' and for the phosphate-grown DNA are not significantly different, and the arsenate-grown DNA has an arsenic level that's less than twice this. How did such a dreadful piece of work get published? And I just noticed that it has 12 authors! What can they all have contributed (certainly not molecular biology expertise)? ODs are linear with respect to concentration. The growth process is exponential (initially anyways) so, the concentration of bacteria increases exponentially, therefore, the only proper way to plot it is with a semilog plot, even if the absorbance is indeed the log of transmittance. This would be true for a chemical reaction with UV absorbance versus scattering although I can't off the top of my head think of a positively-exponential chemical reaction. PHB should be able to chelate Arsenic to some extent - As-O could undergo ligand exchange with carboxylate termini that might result from hydrolysis of PHB, and Arsenate could also likely be loosely coordinated by the carbonyl oxygens present in the fully formed polymer. I would also want to see whether arsenic could perhaps even encourage PHB hydrolysis and insert itself in the polymer in the process. Since PHB is just made by dehydration, native PHB depolymerases should immediately start to act when those vacuoles are cracked open, chopping them up into finer pieces whose solubility will vary based on chain length. I imagine it could end up going all over the place during extractions if no cleanup is done using ion-exchange columns (which would take care of the PHB polymer, which itself should be uncharged). Brilliant. One wonders how a research team with molecular biologist members failed to use a modern silica column spin down extraction. It would prevent any talk of arsenic in the aqueous interface. Does anyone (other than NASA) actually use chloroform extraction anymore? Yeah I guess the problem is the EXAFS resolution for the experiment they show is likely not 0.1 A even though with purified proteins, for example, metal distances can be resolved to less than 0.01 as you point out. Regardless, they needed to show a comparison of EXAFS for +/-As samples. The single spectrum is basically meaningless by itself. It's consistent with the arsenate incorporation model but provides no positive evidence. Paul Davies (co-author on the arsenic paper) has stated that GFAJ-1 stands for "Give Felisa A Job". Even though this was likely meant as a cutesy gesture, doesn't it strike you as a bit fishy? If you have seen any of the recorded interviews with this women, you would be struck by the self-aggrandizing and overly sensationalistic way in which she presents the work. As a scientist, I find all of this a bit worrisome. Some of the criticisms presented here further strengthen my belief that their case is being overstated. Because it looks like they are using their bare hands to gather samples, and an unsterilized container as a scoop. I think it's astonishing there is no discussion anywhere in the article about how this bacteria is able to incorporate arsenic into its DNA. If they believed their claims (which, for the record, I do not) weren't they even the least bit curious about understanding it? In this day and age it would have been almost trivial for them to sequence the bacteria to provide some insights into this remarkable alleged adaptation. I suspect the reason they didn't is that doing so would have highlighted the fact that this is an adaptation of a boring-old Earth-based microbe, and not a new near-extraterrestrial lifeform. I wonder if anyone has looked into whether or not this is the bulk of their published work on this subject? Perhaps this Science Article was more of a PR snowjob and they have a more rigorous paper forthcoming, or already published somewhere? I'm learning so much! Thanks Rosie (and everybody else)! Great thoughts. Need some polishing on the English, but okay. If you're thinking about submitting this somewhere, my advice would be: STOP. I don't have time right now to go through it, but you need to fix a few things. On the whole, "what's the doubling time" issue - look at those growth curves. Does that look exponential to anyone? Not me. It looks like that one curve has exponential growth for a short time before stationary, but the others don't approach a linear fit like I would expect. So the user who made the 10 days post is wrong. When you have a growth curve plot, you don't have to "calculate" anything. That's WHY we like them. That uppermost curve has a doubling time of about 40 hours. The middle one has a doubling time of 240 hours (10 days). The lower one has no meaningful doubling time. The metabolics have reached a limit. STILL. That middle curve is not a "happy exponential" growth curve at all. So, saying "it's doubling time is 10 days" is VERY misleading because it suggests the cells are "happy." In fact, the B phase of cell replication is now important. It also seems that no one has paid attention to the D phase, which would also be significant here. There's more to cells than DNA. :) See Schaechter et al. (1958). "...does it matter that, for bacterial cultures, what's being measured is light scattering, not true absorbance?" Offhand, I would think not. Scattered power is proportional to concentration, at least as long as the sample is optically thin. If you want to plot concentration on a log scale, then for consistency you would plot scattered power on a log scale. The logarithm of the scattered power is not exactly optical density (or absorbance), but it ought to be proportional. Hence, it is proper to plot concentration on a log scale and optical density on a linear scale. I have not given any thought to what would happen if the sample were optically thick, but I assume that the researchers and the designers of the instruments knew what they were doing. That's definitely a nice post! Hard to be fully convinced of anything by this paper..it does lack so many controls! A difficult article to read for a guy who grew up watching the NASA moon shots. Every fiber wants to find fault, but it's presented in such a clear and self-evident way that even a mere programmer can understand it. Better the plain truth with a little heartache than all sweetness and a toothache. This is the proper section for you to have your points considered seriously (I handled this section for a while!). Otherwise, you run the risk they will be seen as a rant, or will be put in the Letters to the Editor section, which I think is not appropriate because you have too much analysis. That's my 2c but others who have recently submitted to Science can weigh in. Rosie Redfield writes really revealing reviews. @Michael Eisen's point about not having sequenced the genome. I found it surprising that not only was the genome not sequenced, they didn't even make an attempt to size it with PFGE. An accurate estimation of genome size seems crucial to calculating how much phosphate the cell requires for its genome. As far as I can tell, instead they just picked an average genome size out of Genbank. So comparable Y-axes on a graph would by "Transmittance" and "# bacteria/ml". One could graph both "Transmittance" and "# bacteria/ml" with semi-log scales; the comparison would still be valid. That's the same thing as comparing "Absorbance" (linear scale) and "# bacteria/ml" (semi-log scale). Matt Young will weigh in if I'm in error, I hope. Other than that quibble -- nice post! I think your comments would have more credibility if you removed the ones that suggest what the author's motives are. It is difficult to distinguish between evil and incompetence. Just stick to the facts and leave out the personal jabs. Especially, please correct your comments about the log/linear graphs. Good post, well reasoned for certain, but I'd like to see the rebuttal from the "arsenic camp" scientists who originally made the claim. This article blew a bit of credibility in my opinion when the first thing out of the gate was a dig as the possible lifeforms in the Martian meteorite. Agenda anyone? Just a quick comment: the authors did not do cfu counts. They used acridine orange staining to count individual cells by microscopy. "That's the same thing as comparing "Absorbance" (linear scale) and "# bacteria/ml" (semi-log scale)." Yes, I think that is exactly correct. Absorbance, or optical density, is a logarithmic unit, so it must be compared with the logarithm of concentration, not concentration itself. "I think your comments would have more credibility if you removed the ones that suggest what the author's motives are. It is difficult to distinguish between evil and incompetence. Just stick to the facts and leave out the personal jabs." I could not agree more with this comment - indeed, I think you owe the authors an apology. I seriously doubt that the team is incompetent, but they are certainly not nefarious. Overall a good assessment. The authors of this paper have not presented any convincing evidence that arsenic is incorporated into any biological molecule. All of the EXAFS and other data is consistent with the presence of arsenate in the cells, which is neither surprising nor unexpected. Furthermore, the authors make a futile dismissal of dismissing a century of physical organic chemistry that has demonstrated that arsenate esters are orders of magnitude more labile than phosphate esters: they propose that the vacuoles in the cells *may* contain poly-beta-hydroxybuturate and that it somehow can reduce the rate of hydrolysis of arsenate esters significantly. There is no solid evidence for either assertion, nor do they consider how vacuolar polymers can affect the reaaction rates of biological molecues outside the vacuoles. Astonishingly, the authors do not recognize the most obvious possibility for the large vacuoles in the arsenic-grown bacteria, namely that the bacteria may be sequestering arsenic. This paper could not have passed peer review in any society journal in chemistry or biochemistry. For an instructive contrast, review the literature concerning the reports of the first cadmium-containing enzyme, a delta-class carbonic anhdyrase from Thalassiosira weisflogii. The authors of this series of papers discovered an organism that accumulated cadmium (a normally toxic metal), purified the protein responsible for bioaccumulation, and then demonstrated the presence of cadmium in that molecule by isotopic labeling, EXAFS, and X-ray diffraction. Solid. You undermined your own credibility when you so personally attacked the character, integrity, professionalism and motives of so many reputable scientists. This includes not only the researchers themselves (who you characterized as "bad scientists") but also NASA who you smeared as pushing an pro-ET agenda and the editors of the journal who you suggested sacrificed their professional integrity to get a high profile article published. If this was about science then you should have confined your comments to the science, and not smeared the people involved with your own speculation as to their motives. In so doing you have undermined and distracted from your objectivity. Do you have specific knowledge of the peer review process related to this study? It seems to me that many of your concerns may have been addressed there. I don't know whether they were or not, do you? It has a striking analysis of the uM concentration of phosphate in the buffer, and how this more than high enough to make "normal" DNA. Extremely interesting the reference to bacteria growing in the Sargasso sea. The authors have no one to blame but themselves for this backlash. Before you decide to hold a press conference at NASA to hype your latest Science paper, it would be a good idea to think critically about your data and perform a few real control experiments. The authors didn't do that, as evidenced by how easily their data has been demolished on the blogosphere. This isn't a paper that makes some interesting points but also has a few technical problems. The problems are numerous, fundamental, and obvious to anyone with a fleeting acquaintance with biochemistry. There must be something very, very, very wrong at NASA, at Science magazine, and in the minds of the authors for this story to have made it this far without someone raising serious questions about what was going on. This kind of stuff has negative consequences for all of us who are practicing scientists. The most prestigious journals publish and the widest press coverage is routinely awarded to the papers that are the least credible. If you wanted to design a system that rewards and encourages charlatans, this is how you would do it. When these papers are retracted months later, there is none of the fanfare that accompanies the initial announcement of the false findings. Rosie is doing a valuable service to the scientific community by getting out in front of this, while the hype is still fresh in everyone's minds. "Matt Young will weigh in if I'm in error, I hope." Well, I did, but my comment seems to have been removed. In essence, I agreed with AMac and GregH, and suggested that an apology was due the authors of the paper. I did not save my comment, but I will try to reproduce it on Panda's Thumb if necessary. If the As paper turns out to be dubious as well, it raises very serious questions about the editorial policy of Science and the quality of the whole journal. There's an trend in this comment thread that is occurring elsewhere on the Internet. Namely, the biologists are slowly and surely finding bigger and bigger holes in the methods, results and interpretations of the Wolfe-Simon et al paper. As others have noted, this is not the first paper that passed right through Science's quality control filter (the longevity study Tuuli just quoted is another perfect... well, imperfect example). Some of the non-biologists are attacking the tone of this post (after failing to note such basics as the fact that cfu counts live cells whereas OD counts all cells, live or dead). Use of the tone argument is a sign that the substantive arguments have been exhausted. Invariably, biologists don't argue over a paper that discusses star formation dynamics. So my suggestion to the non-biologists is that they let us evaluate the science thoroughly and rigorously. After that, we can all discuss the repercussions of the announcement on research and science funding. Nice criticism and there's more out there. I don't get the graph scale discussion, Rosie seems to me to have it right. Absorbance is already log so that an exponential decreasing intensity with a thicker or denser sample becomes a linear measure of same. Then it must be wrong to compare that linear density measure on a linear scale with a semilog scale for another linear density measure (# cells/volume)!? I'm working with transition metal homeostasis in bacteria and I think there are plausible explanations other than As-DNA. If you read the Article: Purchase et al. 1997. FEMS Microbiology Ecology 22:85-93 at Fig 1, You will see clearly that bacteria can accumulate intracellular compounds (Glycogen or PHB) in the presence of metals (cadmium) similar as those seen in Fig1E from Wolfe-Simon et al (bacteria growing in +As/-P). Then As could have the same effect as Cd. An irrefutable way to support they senteces would have been include analysis such as Ferrer et al. 2007 The cellular machinery of Ferroplasma acidiphilum is iron-protein-dominated Nature 445:91. @ anonymous (7:36 pm): My postdoc Josh Mell came up with what I now think is the correct explanation for the growth-curve anomalies and the inconsistent doubling-time estimates. The key point is that the bacteria are not dividing after about about 160 hours because they've run out of phosphorus (cell counts, Fig. 1B). But they are accumulating more and more polyhydroxybutyrate, as they have abundant glucose. The PHB granules make the OD keep going up linearly until about 380 hours, when the cells are presumably stuffed to the limit with PHB granules (Fig. 1B). This means that all their growth rate calculations may be totally wrong, if they were measuring OD and not cell counts by acridine orange. I also, belatedly, realized why the DNA prep from the phosphate-grown cells has the fat bands of ribosomal RNA typical of DNA prepared by a simple phenol extraction and ethanol precipitation, but the DNA from the arsenate-grown cells has no detectable rRNA. It's probably because the arsenate-grown cells are so starved for phosphorus that they have the absolute minimum number of ribosomes. This would also explain why Table S2 gives the analysis for RNA only for the phosphate-grown cells. Bravo! It's about time someone out there was going to challenge this discovery. Whether you are right, wrong, or in between - we need this kind of sound discourse. I should note, right off the bat, that I used to work with one of the researchers associated with this paper. He's been doing Arsenic related research for some time. I do think this is a case of some folks getting a little over excited and going to press with information sooner than they should have, and the press has done a poor job on explaining the preliminary nature of the data, though it was clear to me that this is far from the final word on the subject. That being said, your commentary crosses over from being a criticism of the science into calling into question the integrity of the researchers involved, which is rather poor form, and extremely unprofessional. It's one thing to be a skeptic, and another thing entirely to accuse people of lying (which also suggests that you are more clever than Science's reviewers, having seen through all this deception! Which is of course possible, but we have no way of knowing how your qualifications and experience stack up to theirs). I'm also a little skeptical of some of your critique, based on the number of mistakes that have emerged, and lack of clarity hear and there, but I recognize that this is just a blog post, and not, in fact, a scholarly article, and the standards are not the same. Another thing I'd like to know is why did they not just determine the molecular weight of the "arsenic" DNA vs. normal DNA? This could be rather easily done using an old-school sedimentation rate experiment. Since the atomic mass of Arsenic (74.92) is more than twice as high as that of Phosphorus (30.97), Arsenic-containing DNA fragments of the same base pair sequence and length should migrate at a much faster rate than their Phosphorus-containing counterparts. But I suppose you would still end up with the question of whether the arsenic was actually part of the DNA backbone or just associated with the DNA molecules but not incorporated into them. Have some of you went through the cited papers in the article? I´m not gonna discuss anything as some of you rather like to pay attention on the written sentences than any other information about the article. To me it is also clear that they are lacking of some deep chemistry analysis, but all across the article are cited papers where it is shown nucleosides bonding with Arsenate. May have shorter half-life but their kinetics are similar. "I don't know whether the authors are just bad scientists or whether they're unscrupulously pushing NASA's 'There's life in outer space!' agenda." This whole thing is grossly inappropriate. You should have sent this to the journal of record FIRST, where it can be properly reviewed. You're not some advanced hobbyist layman with a good idea but no standing. You'd almost certainly be given a full hearing in the appropriate forum. You may well be dead right. It's a pretty thorough challenge, and you make some excellent, perhaps even unassailable, points. But what you've done is question flawed methodology in the research by using your owned flawed methodology for challenge. Since this constitutes a formal challenge without review, I urge you to take it down until it has been properly reviewed. And I'd keep accusations like the above quoted out of any formal challenge. You come across like you have an ax to grind, and while that may make you a star on the Internet, it'll cost you respect in the professional community. Probably already has. I do not think that every single opinion and comment we, as scientists, have or make should be peer-reviewed. If they decided to publish this paper too soon, then they must face the consequences of their decision and questionable science. The paper is out there for anybody to comment. I am willing to think that we are in a free world where I can comment a paper freely. Moreover, I think Rosie's post got actually refined by comments of readers here, and improved at the end. Indeed, this is a blog, and if someone wants to say the paper is a clear example of poor science, free to do it. Especially considering that this seems to be the case. The author's preparation of nucleic acids by phenol extraction and ethanol precipitation should yield abundant ribosomal RNA, sheared genomic DNA, and intact small DNA. It is true that slow growing cells will have fewer ribosomes, but not a large enough reduction to eliminate the RNA. The figure and legend do not reveal the sizes of the DNA standards and those standards migrate faster than the samples anyway. So there is no idea of the size of the nucleic acid on the gel. The sheared genomic DNA would not have a discrete size and would smear into the background. If the sheared genomic DNA is running at the snaking rate, the frictional coefficient should be the same whether it had arsenic or phosphorus. My guess is the bands that they boxed and analyzed are linear plasmids. Very good analysis of the paper and I agree with much of it. But doesn't the simple fact that bacteria grow better with arsenate (squares in figure 1) than without (triangles) mean that they are using arsenate to grow? Even if Arsenate can't replace Phosphorus everywhere, it must be at least mitigating the effects of the lack of it. Can I translate your post into Spanish for posting in my site? (I will post link back to this blog and cite you as a source, if you allow me). "In Fig. 1 (below), the correspondence between OD600 (Fig. 1 A) and cfu (Fig. 1 B) is not good. Although the lines in the two graphs have similar proportions, OD600 is plotted on a linear scale and cfu/ml on a log scale (is this a shabby trick to increase their superficial similarity?). OD600 in arsenate medium was almost as high as that in phosphate medium, but the number of cfu was at least tenfold lower." In this comment, you are leveling a serious accusation based on your own fundamental misunderstanding of optics. Absorbance of photons is exponential with respect to the number of absorbers. Therefore, one would *expect* these two graphs to have different-sized axes. If a small increase in cell count led to a small increase in OD, that would be a problem. As it is, the authors of the paper present a scientifically-sound independent measurement for the number of cells in the experiment. This technical flaw in your argument, combined with the unprofessional tone of this post, take away from your credibility. As always Rosie, you rule in terms of your scientific criticism. What did the authors suggest would be the selective force on these bacteria to use arsenate instead of phosphate in Mono Lake? Is there no phosphate at all in Mono Lake? If phosphate is a fundamental chemical I would think that very strong selection would be have to be present. Glad to hear that you're crafting a letter to Science. Define "unprofessional." I suspect you're using it as a synonym for something else. Real science is a contact sport and if you don't like it find something else to do—like knitting. What do YOU think is the proper response? Are we supposed to just pat everyone on the head and say, "There, there, I'm sure you didn't really mean to deceive the entire world with your exaggerated and unsubstantiated claims"? Is that what being "professional" is all about? If so, I want no part of it. Anon: Absorbance of photons is exponential with respect to the number of absorbers. No, you're thinking about transmission. Absorbance is linear (within certain ranges). Thus absorbance *is* linear with respect to the concentration of absorbers. Note however, that absorbance of the cultures really isn't measured at 600nm: Light scattering by particles is the phenomenon that the instrument is detecting. The reported absorbance unit tends to be linear with regard to the number of cells (within a certain range), but can be affected by cell size and dimensions relative to the wavelength. Your advice is tantamount to suppressing criticism on the grounds that peer review in science journals is the only way to counter bad science. That's absurd. That attitude has led to the situation we find ourselves in today with all kinds of very bad science sitting out there in the scientific literature. The experts know that the papers are flawed but nobody else does. That's because no expert wants to waste time writing up a critique that has a very slim chance of possibly being published several months from now. Instead, they'll just make sure all their colleagues, students and postdocs know enough to ignore the paper. Blogs are just making this process more public and that's good thing. It's the way science has always operated. OK, I'm reposting this comment, which I originally left at the panda's thumb, because it seems quite a few people are making the same error. So in most cases, including the arsenic paper, OD600 is proportional to cell density, not log cell density. As for Rosie’s point, I think she’s being a little harsh, for this particular point (her other criticisms are spot on, as is her point that these problems should have been caught in review). OD600 is normally presented on a linear scale (mainly b/c the dynamic range is only about a log or so), while cell density is often presented on a log scale; so the respective scales for each figure are fine. Nevertheless, Rosie is correct to point out that these two graphs cannot be compared directly, without correcting for scale. Interesting post. I totally missed that bit about "all values multiplied by 10^-6" as well as the use of two different scales.. The findings are nevertheless interesting, because some low level of substitution of As for P is taking place. The presence of even a few As/P substitutions in the DNA backbone would, as far as I know, make the molecule incredibly unstable to hydrolysis. Unfortunte, though, to see data presented in a misleading manner. One error I did notice, however, is that the water of Mono Lake has an As concentration of 200 micromolar, not 200 millimolar as you stated (Link). Oops. Missed Tim's post before I sent mine. Shorter me: "what Tim said"
And...Carl Zimmer has picked you up and posted your great work on Slate. Being professional means not questioning a researcher's ethics and integrity without having some pretty solid evidence to back up your claims. I don't know what circle of academia you come from, but questioning a researcher's professional conduct is serious business where I come from. So, you damn well better have more than a "bad correlation" and an axis that isn't labeled the way you'd like it to be before you start throwing around accusations of misconduct. One of the authors on the paper (Ron Oremland) is about to give a talk on NASA TV, at 1 PM today (EST). There will apparently be a stream up on NASA TV's website. Sorry if this point has been mentioned before (I have not checked other comments), but the concentration of inorganic phosphate in the ocean water is about 1 nanomole, and the ocean bugs (cyanobacteria in the first line) cope with it. There are many papers on what solutions they use (e.g. replacement of phospholipids by sulfolipids). So 1 mkM of phosphate in the growing medium is a lot. This story - as a whole - deserves a comment in Science or Nature. If you need any support (references, further expertise), let me know. I watched the press conference live,and in fairness to NASA, they had an excellent skeptic on the panel. I forget his name, but he reminded me of the Feynman episode, dunking O-rings in cold water. Only he used aluminum foil. @Sebastian. Please do translate this into Spanish. It would be great if you could include the comments too, as I think they add a LOT of value to my post. @John Cannon: Uncut chromosomal DNA typically is in fragments 50-200 kb in length but, in a conventional gel like this which cannot resolve these sizes, typically runs as a fairly sharp (often smeary if its concentration exceeds the capacity of the agarose). "The emotion generated by an issue is inversely proportional to the quality of the data," as they say. Let me gently suggest that a letter to Science might not be the most productive way to address the clear lack of confirmatory experiments in the Science Express article. Such debates rarely advance the discipline much, partiucularly when they contain allegations of dishonesty and stupidity, as does the text of the instant blog. Instead of attacking conclusions that are based heavily on conjecture with arguments which are themselves based heavily on conjecture, a better approach is to conduct higher quality experiments to test the authors' hypotheses. That's a much better use of the community's resources than arguing without real data like a bunch of economists. It behooves scientists to stow the rhetoric and get to work. "We then used high-resolution secondary ion mass spectrometry (NanoSIMS) to positively identify As in extracted, gel purified genomic DNA (Fig. 2A)." Although I agree with a lot of your criticism, it does appear that the DNA was purified away from the gel. I think that the "life elsewhere in the universe" is going a wee bit too far, but am still excited about the possibility that As in incorporated in biological molecules at all, not matter what the species or environment. All this shows is that further experiments are necessary to flesh this out. Isn't that what science is all about? Physicist here: thanks very much for qualified critical comments. I'm sure there are many scientists out here who would like to be informed, but can't do much with the extremely abbreviated style of writing in Science. It's much too difficult for me to read it critically, yet I would like to know "the answer" or "bottom line". I didn't get a good feeling when I read some backstory about how this was work by a grad student, and even I could tell that the work seemed to be larded with confirming checks rather than checks which would refute. The first author states in this video that she has tried cesium chloride gradients, donno why the results aren't included. She seemed to indicate the fraction moved at a different band but she thought it might've been supercoiled. I didn't read anything about misconduct in this post. Who said misconduct? She said, at most, "incomplete, sloppy work with unjustifiably broad conclusions in a paper" (I paraphrase). And complaining about insufficiently rigorous referees. That's not misconduct. You're trying to elevate it. I'm not sure you get it. I don't think you know what misconduct means. The first thing I noticed was the statement "with no added phosphate" in every other sentence. This is a sure sign that the authors were aware of the fact that the average phosphate levels in the ocean are 2.3 uM and can be as low as ~nM as Armen pointed out (The lead author has her PhD in Oceanography and other members of the team look at phosphate levels throughout Earths history). This implies that they were being intentionally misleading. The second thing is was their inappropriate utilization of mass spec. A number of members of the team are part of the "Follow the Elements" group at NASA. Unfortunately the bonds these elements form (ie molecules) is what matters, not their elemental composition. They performed no relevant mass spec experiments to verify that arsenate was incorporated into any biomolecule. nanoSIMS gives elemental composition, not molecular masses, which would be required to identify arsenate in an actual molecule. It is very suspicious that they choose not to do standard mass spec experiments, especially since they are very fast and very cheap. May I translate to spanish and publish a resume of this post in my blog? So I was wrong to claim upthread that transmittance at 600 nm is proportional to bacterial concentration. It is absorbance. Torbjörn Larsson's comment is correct. This is in reference to Rosie's remarks on Fig. 1's portrayal of growth kinetics. In the top graph, Wolfe-Simon et al plotted OD680 linearly against time, while in the bottom graph, they plotted cells/ml versus time in semi-log fashion. Rosie is correct to assert that the apples-to-apples comparison would have both graphs fully linear, or both graphs semi-log. Beer's Law states that absorbance varies linearly with the concentration of the absorber (assuming path length, etc. are held constant). The concept is applied to charting bacterial growth in these lecture notes from a first-year biochem course. Very strange. At 9:19 someone called Jeremy (same as me) made the same comment I am about to. I missed the x10^-6. Saw what I wanted to see. I also interpreted the 6.9 as a P:C rather than an As:C ratio - because the reverse didn't make sense - duh! A question. Could the nanoSIMS technique be confused by agarose contamination? (I don't have the paper right now.) was the SIMS done on a gel slice or purified DNA? First, measuring the mass of modified DNA is a technique I first published on in 1993. We made DNA containing a single thionucleoside, and could modify the sulfur with electrophiles and confirm the covalent modification with ESI MS. Correct me if I'm wrong, but the field of mass spectroscopy has advanced a bit in the past 17 years. Second, my guess is Frank Westheimer was correct in his analysis of arsenate-containing DNA. He was a pretty smart guy. Fourth, it is exceptionally sloppy to run experiments where both phosphate and arsenate are present. I know this is complicated, but how about purifying reagents or buying purified reagents? I think these guys had a bit of money to spend, so they could afford ultrapure reagents. Methods aside, what about the NASA spin machine? Even if some As was in the darned DNA, what does that have to do with outer space? The press was expecting aliens. "Astrobiology?" WTF? AND BTW - this NASA hype has been going on in other fields. A very recent example was along the same lines: sensational claims supported by sloppy science, VERY sloppy science. What is NASA's problem? Re Larry Moran: Describing another scientist's work as "a shabby trick" and "lots of flim-flam" and "bad scientists" and "unscrupulously pushing an agenda" is unethical. Seems you think science is akin to a TV political shoutfest. It's not. The original post was extremely unethical and irresponsible. If you can refute the work, do so. And you refute work with your own work, or your published criticism, which gets reviewed, not with a blog. just a cotton-pickin' minute. let's look at your analysis of figure 1 for starters (that's as far as i got before my head felt like it was going to explode) . . .
first of all, the spec measurements were done at OD680, not OD600. you question the authors' motives in using OD680, rather than log(OD680), in graph A. the data in figure 1 is not presented for the purposes of calculating the rate of division, nor is it presented so that you may calibrate the spec's OD680 readings with actual cell concentrations. given the fact that graph B lays out the actual cell counts for you in log scale, your suggestion is pointless, redundant, and misses the point. seems to me that the point of this figure is to show that when the OD680 for the phosphate-fed bugs levels off, so too does the cell count. however, this is not the case for the arsenate fed bugs; when the the cell count levels off, the OD680 continues to increase. optical density is greatly influenced by particle size and shape. 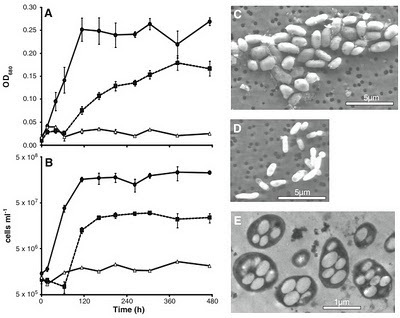 as can clearly be seen in figure 1 (C and D), the arsenate-fed bacteria are larger and fatter than the phosphate-fed bacteria. this explains nicely the lack of OD680 : cell count correspondence between the two samples. this is standard fair -- why does this worry you? furthermore, you correctly note that the OD680 continues to rise for the arsenate-fed culture even after the cell count levels off. this is not observed in the phosphate-fed samples. however, you incorrectly infer that the increasing OD680 (shortly after ~120 hours) is due to cell growth, despite the fact that the cell counts suggest stationary phase has been reached. if this is simply compensation for cell death, why isn't this observed for the phosphate-fed bugs? 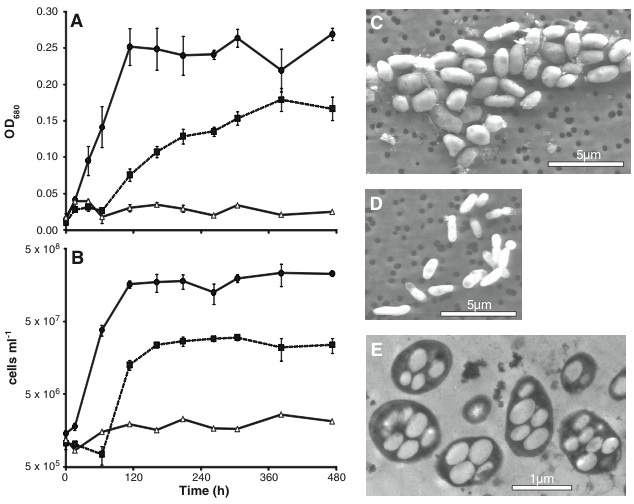 although it is hard to know for sure what is going on here, another possibility is that the large vacuole-like structures observed in figure 1 E continue enlarging even after stationary phase has been reached. this would effect particle size and, thus, OD680. it would be nice to see TEM images of the arsenate-fed cells at various time points during stationary phase, when the OD680 is rising, but the cell count isn't . . .
finally, the growth you take issue with for the non-supplemented sample is really a non-issue. compared to the phosphate-fed and arsenate-fed cultures, it is essentially no growth and serves it's purpose as a negative control. you know as well as i do, experimental results are almost never 0% or 100% in science -- especially not in biology. for the record, i am a die-hard skeptic. carl sagan said, "extraordinary claims require extraordinary evidence." DNA containing an arsenate backbone is certainly an extraordinary claim, and this paper is simply presenting it as an hypothesis. extraordinary evidence will follow if such an hypothesis is true, but this will take a considerable amount of time and effort. What NASA did was represent a very simple, relatively standard exercise in microbiology (directed selection), and try to spin it into "There's life in outer space, give us money to find it!" It's still remarkable that these bacteria can grow in the presence of that much arsenate at all. If they don't use it as if it were phosphate (and I agree that the paper fails to show that that's the case), that means they somehow manage to keep it away from their ATP synthase and their phosphorylases. Is arsenate really chelated by PHB? Someone should test that... and publish the results in Science. To those who say things like "unprofessional"... I agree that Hanlon's Razor should never be ignored: never assume malice where incompetence would suffice. But to claim failure on the parts of authors, reviewers and/or editors is normal in science, and that's a good thing. What struck me about the article was the strange choice of experiments performed by the authors. As many others have pointed out, simple and obvious experiments were not performed (or at least not described). Those are experiments obvious to even beginning graduate students. The many authors are not neophytes. What bothers me and many others that I believe hasn't been made clear, is that this is not just an issue of doing the right experiments with the proper controls. Multiple checkpoints must have failed for this paper to have been published in Science and draw such large public attention. I think misconduct is an inappropriate and irresponsible charge, but it looks like there have been failures of scientific responsibility on the part of collaborators, hyperbole beyond the norms from the lead authors, inappropriate promotion by NASA, and failed editorial/peer review to begin with. I actually thought the mass media did a reasonable job of covering a high profile paper by including many critical viewpoints from other leading scientists. I applaud Rosie for taking the time to address the scientific issues in the paper. I especially appreciate Rosie taking leadership in writing back to Science. She has put in a good amount of work that may never be published, doesn't help her career, and may make enemies. Those who are critical of her analysis, I suggest you write your own letter to Science, NASA, and the newspapers. When I heard the news about the bacteria I couldn't wait to read the paper, and was very disappointed. Clearly, there are numerous problems with it. What I can't understand and bothers me the most is, however, how did this paper get in "Science". One could see that the paper was submitted in the end of September, and got published a few days ago. Therefore, it has been published only 2 months after submission. The reviewers presumably did not require any additional experiments! I am wondering what would happen if I sent a similar manuscript to Science; would I get published? I have plenty of bad gels. The EXAFS analysis, assuming it was done correctly with an adequate spectrum, could show one had an arsenodiester. I don't have access to their paper, but I'm presuming whatever coinvestigator did the EXAFS did so competently. An arsenodiester could be DNA; but it could also be arsenic incorporated in a phospholipid, as Steven Benner suggested, which ultimately would have to come from glycerol-1-arsenate. This could come ultimately from ADP-arsenate, via glucose arsenates, aldolase and then reduction. ADP-arsenate hydrolyzes quickly, but not *that* quickly. the presence of As(V), makes ribose-1-arsenate and purine. That would be a plausible route for the formation of arsenomonoesters. Those would look similar in EXAFS to the diesters (the slightly less intense wiggle from the missing carbon would be easy to miss). It's nice to see someone who can appreciate the EXAFS data here. I agree with your analysis, but the conditions under which they conducted their EXAFS (using cell material rather than purified extracts for the values they assign the As-O bond-length) would seem to make the data too dirty to assign to any particular bonding regime. As well, to expand on my previous statement regarding Arsenic chelation by poly-beta-hydroxybutyrate, it would seem that you could bind Arsenic via calcium arsenate formation in the PHB, as Calcium is quite readily bound by the polymer (and some papers suggest that PHB might serve as a long-term phosphate storage center in the form of calcium phosphate - phosphate could be replaced with arsenate here). The question I would have is, is this bonding distance similar to that which they find in the EXAFS study done for the Science paper? It actually made me glad I studied biology at university, and am thus able to follow your criticisms. I really haven't genuinely felt that since I graduated several months ago. I'll second Bryant that it's nice to hear from an expert on the EXAFS. However, if you think they had the resolution with the EXAFS to detect an arsenate diaester in DNA (from a sample of cell extract) why wouldn't they show a side-by-side comparison of a spectrum from +Pi treated and +As treated samples and highlight the systematic differences reflecting the differences between arsenate vs. phosphate bond lengths? Also note, that the As:C ratio reported results in a calculated approx. 1:10000 ratio of As to P in the DNA backbone. I certainly understand that EXAFS could distinguish an arsenate and phosphate diester model compound that is highly purified but I'd be surprised if the +/- arsenate samples they work with here would look different by EXAFS. Let me know what you think - but take a look at the paper if you get a chance. I could post pdfs of the Science article and the supplementary online material here, but Science might take me to court. Maybe someone else could put them somewhere public ("WikiScienceLeaks"? ), and anonymously post the link here. @JeremyB: Inclusion of the agarose gel in the analysis means that at least 99.9% of the carbon came from the agarose, not the DNA. This makes their background As:C ratio of about 8 ppm even more surprising. It hurts me a bit to see the academic community being so petty. We should criticize the science, not the people. I'm not an EXAFS expert by any means, but I have had to learn to interpret the spectra (and my wife does all sorts of exotic X ray spectroscopy.) So here it is in the nutshell. EXAFS is element specific. The absorbtion edges for As are far away from those of P. You can see tiny amounts of heavier elements in a sea of light elements. It's a self interference phenomenon. The absorbed or emiited photon in effect diffracts off the nearby atoms, giving wiggles in the X-ray absorbtion near the edge. The frequency of the wiggles is related by Bragg's law to the distance from the atom from which you're scattering.That's basically a Fourier transform, and it's pretty accurate. The depth of the wiggles is related to the number of atoms at that distance, and it's far less accurate. So I'm sure they can see four oxygens at typical As O distances, probably two single bonds and two shorter bonds, and probably carbon at a longer distance. Is it good enough to adjudicate between two carbons or one? Don't know; from what I've seen of EXAFS work on first row transition metals, it is if you have good data. But it probably indicates at least that it isn't plain old inorganic arsenate. It certainly isn't specific enough to say 'DNA'. We ARE criticizing the science. It is chemically unreasonable. Arsenate esters and anhydrides hydrolyze in water. Phosphate esters and anhydrides don't. Ultimately, this is a chemical question, as the intermediates and DNA/RNA have to be stable. There is literature precedent that ADP-arsenate, a necessary intermediate in the proposed incorporation of arsenic into DNA, is hydrolytically unstable. if the chemistry can't happen, this is all nonsense. It's like travelling faster than the speed of light. Cool if you could, physics says you can't. It seems that I had not paid enough attention and forgotten about Lambert's (or Beer's) law, which you may look up in Wikipedia and which actually makes a brief appearance in my own book on optics. My apologies for messing that up. The commenter further notes that optical density is commonly presented on a linear scale and concentration on a logarithmic scale, but that the two are not directly comparable. I still claim, though, that there is no reason to think that the authors of the original paper did anything underhanded and that accusing them of trickery was way out of line. The coauthor who did the EXAFS was Sam Webb. I know Sam and I think he's awesome. However, I have also done micro-EXAFS on his beamline 2-3, so I know a bit about the technical problems here. Given the arsenic concentrations they are showing in this paper, I really have to wonder about the quality of the EXAFS data. Neither the paper nor the SI show the raw data or the chi spectrum, only the FT, and this makes me even more skeptical. I don't think I'll believe that part until I see what the data really look like out to the k=13 they claim. As a layman, I have no insight whatsoever into the technical arguments made on either side of this issue. To some degree I can follow the thrust of many of the discussions. But I can neither agree nor disagree with any of their conclusions, nor would I try. However when I come to read statements like "a shabby trick", "lots of flim-flam", "unscrupulously pushing an agenda" and “science is a contact sport”, I understand *completely* what’s going on. These statements say loud and clear to me that, rather than being some noble search for understanding, science is still just another ego battle, with all the smearing, character assignation and pettiness that that entails. That is a particularly unfortunate conclusion in today’s world, where it seems that a culture of willful ignorance is on the rise. Increasingly people seem to prefer the comfort of socially or personally constructed “truths” to any form of truth that has been rigorously debated and defined. Any why not, when they see scientists taking up the language of politicians and trash-talking bloggers? Of course with public funding playing such an important role in modern science, those who engage in such tactics are only digging their own grave. And it can’t be too long before that hole is deep enough for a thoroughly alienated and ignorant society to throw them in. Ah, thanks to some anons and others, I think I finally got it! 1. The only appropriate medium of scientific discourse is formally-published correspondence (in journals no less than IF=20, of course). I will let my supervisor know that next time he'd like to "correct" me on a scientific issue, he's gonna have to go through official, peer-reviewed correspondence. Talking to me directly is informal and sloppy science communication. 2. Being critical of scientific work is equal to an ego battle. Therefore, whenever a scientist gives anything less than praise to a scientific work, they have a major axe to grind. 3. You cannot disagree with a scientific work, unless you do your own experiments and publish them. Thus, I would like NSF, NSERC, CIHR, CiFAR and NIH to all stand back as I swamp them with 203459 grant applications to voice my dissent about all these glitches, big and small, I have seen thus far in my forays in the literature. I would also like a small lab the size of a city in order to engage properly in scientific discourse. Such is the price of science. 4. Any informally-written opinion or critique must be read as a declaration of war or eternal loyalty. The critic can only believe the data are perfect or otherwise has ulterior motives and accuses the target of same. No middle ground exists. Ever. Thank you, guys, apparently we get some really bad research training up here. I guess it's not just Rosie then. I was unaware of the need to be a good, kind and very non-transparent gentle(wo)man for good science, keeping a smile at all times. I also did not realise science and peer review are infallible, and will thus mend my ways and make sure all paper I publish from now on are divine. Or fraud. Cthulhu forbid I produce a human work with errors AND merit, and other humans generate opinions on it. That would be awful. PS: I have two finals tomorrow, I have every goddamn right to be snarky. Thank you for your understanding. I would like to draw your attention to more "philosophical" aspects of these results. Let's assume that indeed As is incorporated at low rate into DNA instead of P. It does not imply that it has a positive/neutral function there! The authors may just catch a state, where cells try to deal with the threat of DNA breaks. Nothing more. Let's imagine we irradiate bacteria. We see DNA double breaks. Do we claim that bacteria survive because they have DNA breaks? It is just wrong logic. I may not be precise enough in my writing, but I hope you understand what I mean. Another thing, from what I understand from Table S2, there is 3.7% of As atoms and 96.3% of P (in molar terms) in DNA of bacteria grown in As. Not 1:1000. I agree that this study lacked some fundamental controls, but you went a bit overboard in places. In two instances you accused the authors of performing the controls and hiding the data. That was way out of line, and frankly very unprofessional. How do any of us know when incongruous experiments are not reported? There has to be some basic level of trust. A naive investigator is very different from an unscrupulous one. I really am hoping that this is ultimately legitimate and all the sloppiness identified herein is simply rush to publication. Because the alternative scenario is dark: young, eager scientist exploited by cowardly agenda types who don't mind her sticking her neck out on this. So why is Paul Davies of the "Beyond" Institute a co-author on this? If this study is bunk, NASA et al. will keep right on chugging, but Felisa is done. @Anonymous: Sorry, I thought I'd corrected the 200 mM yesterday but I must have forgotten to click 'Save'. It's fixed now. Wait a second. This article can't be "real" science because it was not peer reviewed. This is not how science operates these days (at least in the arena of climate science). This is too much like the old fashioned science of Darwin and Einstein where the individual scientist just made his points. Can't have that! We must behave according to the ad populum fallacy and have a consensus before we allow skeptical voices to be heard. Alex Bradley? Who is Alex Bradley in the field of exobiology? Doesn't he know that science is compartmentalized into sub-disciplines and all scientists are to be considered incompetent outside their fields. NASA scientists have declared this in to be in the field of exobiology just like they decided they were climatologists. Where's your degree in exobiology, Mr. Bradley? How dare you voice your opinion without having training it this new specialized field (or just agreeing with the consensus)! Just kidding, this is the way science is supposed to work. I'm also hoping that the NASA scientists respond to skeptics in this case exactly the way they have in the case of climatology to see the reaction in this case. Suppose they ask you to replicate while refusing to provide samples of their organisms or their data on the grounds of state secrets, and privacy. Suppose that when you fail to replicate that they dismiss you as have not used the right organisms. What then? If the arsenic is being incorporated then the proteins of the biochemical pathways of the bacteria have evolved to accommodate arsenic. If this is not true there still remains the fact the bacteria can grow in lots of arsenic... which would then mean the opposite could be true: the biochemical pathways of the bacteria have evolved to absolutely EXCLUDE arsenic. I'm not able to access the paper. Here is another thing to ponder. Even if arsenate WERE shown to be incorporated into biomolecules, what's the big fuss? It's been known that arsenate can replace phosphate since at least the early 80s. That's one of the reasons it's toxic to humans. Arsenate esters are stable enough to last a few minutes, so maybe this thing even incorporates arsenate into the DNA backbone, but the DNA repair would have to be working in overdrive to keep up with repairing the strand breaks from hydrolysis of the arsenate esters. It certainly doesn't PREFER to use arsenate, so it is in no way an 'alternative biochemistry'. Although I agree that the presented results don't show anything at all, and that the experiments lack the relevant controls (Table S1: the -As/-P medium ALSO lacked glucose!? Are they serious? ), we should not lose sight of this issue: even if correct, the findings are actually pretty trivial. Interesting and worth publishing, but not groundbreaking and certainly not the worth the media frenzy. I bet the truth is the bacteria are better at NOT incorporating arsenate. Seems you think science is akin to a TV political shoutfest. It's not. Apparently you didn't watch the NASA press conference. I've blogged about the issue you raise: DNA, Phosphorus, and Arsenic. Feel free to comment after you've done some research by watching the press release and reading the statements made by the authors. Then, and only then, will I respect your opinion on whether the authors of the paper behaved unethically in conducting science by press release. There was enough phosphate in the medium to allow the cells to survive without incorporation of arsenate, and there always will be enough phosphate because live cells will scavenge it from dead cells. There is no convincing evidence that arsenate was incorporated into DNA. The study has fatal flaws. If you can't measure the rate of enzymatic hydrolysis of ADP-arsenate because the background, non-catalyzed hydrolysis is faster, then how is it possible for a nucleotide triphosphate to survive long enough for DNA polymerase to incorporate it into DNA? The Klenow fragment of DNA polymerase incorporates bases at about 15/sec. The rate of uncatalyzed ADP-arsenate is around 2/sec (this number is too low). At 35 °C, the rate of hydrolysis of trimethyl arsenate was measured at 11.5/sec. Triethyl arsenate was 5.4/sec. Bottom line, arsenate anyhdrides and esters are insufficiently stable to permit them to be incorporated into DNA. The comments are as interesting as the original post. Rosie did a great job. There are a lot of questions now, thats good. I particularly liked the question of how much effect there is from scavenging off of the dead bacteria. I believe the original authors said that they have a 2nd paper coming soon. All the comments in blogs are great but people with questions and suggestions, especially ones like Rosie, ought to contact the authors. There is nothing 'Exobiological' about this report. for years and there are non-thermophiles that utilize arsenic. synthesized by organic chemists at the well-known ETA research institute in Zurich, Switzerland many many years ago. The As analogue of dAMP (dAMAs) is surprisingly stable, with a half life of 40 minutes in aqueous solution, so it is not unreasonable to assume a similar stability when incorporated into DNA. Hydrolysis is of course still a problem, but the cell has the appropriate machinery to repair single strand breaks. It might be able to deal with the occasional arsenate in the DNA backbone, but certainly wouldn’t like it. It is however, as Rob said, very unlikely to ever end up in the DNA in the first place, as the arsenate anhydrides and mixed arsenate-phosphate anhydrides are indeed extremely unstable. Still, with a large pool of dAMAs and phosphorylation running at high efficiency, it may be possible for a molecule of d-adenosine AsPP to last long enough to make it into the DNA, where it would then be relatively stable. Possible, but very unlikely, and not something the cell would want to encourage. I have no fundamental problem with arsenate replacing a phosphate once in a while, but the study by Wolfe-Simon et al. demonstrates no evidence for this, and the presentation of the results at the press conference was extremely misleading. Since this story has been so widely reported on in the media (with all the hype that NASA might have been aiming for), we as scientists now have a moral obligation to voice our concerns and criticisms in a publicly accessible medium, such as this blog. So thanks for starting this, Rosie! Rosie that was awesome. Will you marry me? Hello Rosie, I was wondering whether you tried to communicate with the authors of the Science paper about your concerns. If you did, I would like to know their reaction. According to Table S1, the -As/-P medium also didn't contain any vitamins or glucose, so there was nothing for the cells to grow on. The +As/-P and -As/-P media are listed as containing 10 mM glucose and vitamins. I don't know why they would have left it out of the -As/-P medium, it is just a bizarre thing to do. Unless you don't WANT your cells to grow, then it's perfectly reasonable. Pat: Acridine orange is an intercalator, so it stains both dead and live cells (though the colors differ in each case). Also, it enters organelles. If these bacteria were at death's door, they would have acridine orange in their lysosomes. So the acridine orange count versus control could easily be inflated. As a biologist, I can appreciate your concerns about this paper. What I can't appreciate is your nasty and condescending tone towards what quite likely was science honestly conducted, if in some ways imperfect. I have no idea whether these bacteria might use arsenic sometimes in place of phosphate---this is not my area of expertise---but I am never surprised by the potential for biology/reality to surprise me and call in to question what I hold to be true. Second your lack of courtesy is quite problematic and in some ways intellectually dishonest. Keep in mind that these authors submitted there work for editorial review, this paper was referred to recognized experts in the field, and any concerns they had were likely addressed. Undoubtedly, the figures in the paper reflect there results, while the text reflects there interpretations. If you have problems with either, I suggest that you perform additional experiments, test your own hypotheses, and write a paper of your own...not a nasty condescending missive. Finally, you mention that this work wasn't conducted at a level that would be sufficient for a PhD thesis. You're right, unfortunately the space limitations at high profile journals mean that many/most experiments conducted in pursuit of a result are not included in the text. Having published in these top journals myself, be grateful a methods section was included at all, if incomplete. You've impugned the reputation of colleagues for the potential failing of publishing something that may not be quite right or may be totally wrong---big deal! If you yourself aren't already guilty of this my guess is that you haven't published very much. Science isn't an exact science, we can't always know the best way to proceed, or what the best experiments to do are---we depend upon the editorial review process to ensure that publications are as solid as possible. Obviously several experts, and the people reviewing for science are indeed experts, felt this paper was worthy---did you consider that fact at all, before you essentially denounced these scientists as a step below nincompoops and a step above frauds. Your major criticism is that the "As-containing DNA" could have been contaminated. Because they directly showed elemental analysis of DNA, your criticism rests on calling into question whether they analyzed DNA that was physically separated from the water-phenol/chloroform interface, which could have been contaminated with trace As despite multiple extractions, a precipitation and washing prior to resuspending data. A little nit-picky but sure. It's a groundbreaking claim to accept. I have capitalized the relevant sections that address your concerns. Assuming the results were honestly obtained and reported, your criticism doesn't make any sense to me. There is one argument against the paper, which I think nobody mentioned. Arsenate as well as phosphate is poorly soluble in 70% ethanol (this is why DNA purification techniques never use phosphate buffers. If a phosphate buffer is used, DNA precipitation is achieved by PEG). Does anyone know where to find data on how arsenate and the various soluble molecules from the cytoplasm partition in phenol and phenol:chloroform extractions? The authors say that most of the small m.w. metabolites will be in the phenol (no source cited), but I and the few people I've checked with have always thought that they stayed in the aqueous phase. In Table 2 80% of the 73As label was in the phenol. But there's no controls. Rosie, Your answer at 6:38PM indicates to me that your calculations on the incorporation of As into DNA are screwed. I think the relevant figure is the one in the supplementary material plotting As content against P for the gel slices. I know little about nano-SIMS - is this standard practice? But these measurements look very wierd to me. * If agarose is responsible for the C-signal, then The As:C ratio quoted in the main paper is _completely_ dependent on the amount of DNA in the gel slice. It is entirely irrelevant. * The As+/P- DNA gel slice has lower than background phosphorus in it. * Why not extract the DNA from the gel and run the method without the agarose background? And I disagree with your comment on the scales for the growth-curves, this is standard practice IMO. But the nano-SIMS pictures of the bacteria are another matter. Completely different scales for P and As. It would be easy to be mislead into thinking that the bugs grown on As-rich media do not have any phosphorus and vice versa. Sorry if this is already covered above. @Pat Foster: We need to know how much of the 3.1 µM PO4 in the +As/-P medium came from the arsenate supplement, and how much was present in the unsupplemented medium used for this experiment. If we trust the numbers in Table 1 we can make some predictions. 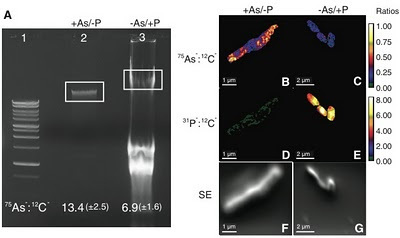 If the researchers used the Apr.5 batch of unsupplemented medium (3.7 µM PO4), the failure of the cells to grow likely means that they need more than 0.26 µM arsenic (though probably not to replace phosphorus). But if the researchers used the June 11 batch of unsupplemented medium, then the cells would have failed to grow because it had too little phosphate. Given such dramatic variation in medium constituents, they really should have specified which medium they used. They should also have specified which medium the cells were pre-grown in. @Jeremy B: I made the calculations in my post (400 and 200 atoms of arsenic) before I realized that they had assayed the whole gel slices, not just the DNA. If everything else is correct and the arsenic really is in the DNA itself, then these numbers need to be multiplied by at least 1000 to compensate for the agarose carbons. But that predicts that the DNA from the phosphate-grown cells would have 200,000 atoms of arsenic, which as absurd. Everything we do with the data in this paper leads us to numbers that don't make sense! The supplementary material gives As:P ratios for the gel slices - you don't need to make assumptions on agarose concentrations. From memory, I think As was about 0.3% of P. So about 13000 atoms per 2x10^6bp genome. Whether it is professional or non-professional, ethical or non-ethical, you had done a great job in dissecting the much hyped findings and posting it in your blog. Many researchers claim that current peer-reviewed system is the best and that this is how science works. However, I argue that this should not be the way the science work. Two months back, I published a book titled "The systemic practice of misinterpretation of scientific data"(http://www.universal-publishers.com/book.php?method=ISBN&book=1599428202). I had argued that a number of research findings are fundamentally flawed even though they were approved by peer-reviewed process. It is high time that some of the practices in science need to be checked and scrutinized. "You come across like you have an ax to grind..."
@11:33am Comment By anonymous - Awesome Comment - Thank you !!! Here are videos of the lead author in the press release. Her answers ... her mannerism ...etc.. she thinks of herself as the Queen of Science and naming the bacteria "Get Felissa a Job" .. i think she would ever find a job with that attitude. The authors of the paper deserve scrutiny not just for their science but also for the manner in which they represent it to the public. It is this second point which justifies questions of the scientists' motives and demands a discourse from outside of and about the peer reviewed publication forum (in fact, the scientific debate wouldn't even be a big deal if it weren't as visible to the public; minus the press conference, no one would have been too worked up by this research). This is an ethical or social question and one for which the authors, the journal, and the publication process, in general, should be accountable. The blunt honesty of the "Get Felissa a Job" highlights one of the things at stake: hyping research to the public can have real implications for who does and doesn't succeed in a profession in which it can be difficult to "make it." If you assume the number of jobs is a limited quantity and who gets them is a zero sum game, then researchers who hype their work to get ahead do so at the expense of those who refuse to engage such tactics (and those who never have the opportunity). You could argue on the other hand that such hype serves to improve public awareness and increase funding for scientific pursuits, thus offering benefit to the community at large. (I think both positions hold some truth.) However, encouraging funding by misrepresenting or overselling research findings is problematic as well. Beyond the pure ethical question (is it right to deceive others, even if it benefit's society in the end? ), this tactic is dangerous, not only to society as they try to appropriate funds responsibly, but to the scientific community as well. Making tacit promises of the social benefit or broader interest of scientific research seems awfully short-sighted to me. I find the research of this paper (and the scientific dialogue prompted by it) incredibly fascinating, but claiming it is interesting because it pertains to a search for extraterrestrial life, unnecessarily raises the stakes and places a burden on the scientific community to fulfill such promises or risk losing our fragile public support. I think this is part of what NASA is struggling with these days as the public fatigue over what can be seen as unfulfilled promises threatens its public support and, sadly, puts more pressure on them to over sensationalize research like this. It's a vicious cycle and, I fear, an unsustainable bubble that threatens to pop and backfire by deflating funding in the future. To ignore these realities is not acceptable. I feel strongly that the parties responsible for using this research to deceive the public should absolutely be called out and their motives questioned. If the authors of this paper continue to refuse to defend themselves in a public forum--basically, defending their press conference, not simply the science--I think that is shameful. They should do everything they can to clarify the significance of their findings, especially to those who are least equipped to interpret the data for themselves. Hiding behind the lie of the "professionalism" of peer reviewed discourse is not acceptable, especially since they were the ones who initiated the public discussion with their press conference: if their motives are sound, they should explain their science better, even if that means the lay public will be less excited about it. That being said, I don't think the authors should bear the sole burden of responsibility. I would like to see greater accountability for organizations like NASA and for scientific journals, as neither should be pushing substandard or rushed science in the interests of making a media splash to reap financial rewards. I agree. The controls are far from "controls." This scientist needs to get back to the bench and finish the study. Perhaps she is spending too much time with the popular media "selling" her "ideas" --rather than "proving" her ideas. Great job Rosie!!!!!!! Now the media loving scientists should analyze their data at least twice and make sure that they have used the acceptable scientific procedure before publishing a paper. It also point blank towards Science reviewers who just move this paper because fo the name of NASA in the manuscript. Am I the only person who remembers the 1983 Nature letter which claimed bacterial growth at 250 °C? (Baross & Deming, "Growth of 'black smoker' bacteria at temperatures of at least 250 °C," Nature, 303, 423 (1983)) There was a storm of criticism, much of it focused on the inherent instability of everything biological at 250 °C, and the claims were refuted. I don't see much point in focusing on the DNA evidence. You need ATP with arsenate in the alpha position to make the DNA. It would be easy to find. Typically, ATP concentrations are around 1mM. Of course, it's not there because arsenate-phosphate is unstable, as referenced earlier. Each cell then needs 1x10^7 atoms of phosphorus for DNA, and 2x10^7 for everything. Just so you don't feel too bad about that 7 days comment, the doubling would actually be slightly less than 7 days, not slightly more than 7 days. I find your arguments very compelling. Although it is a small matter, I wouldn't bother criticizing the 16S rRNA sequencing identity and relatedness to Oceanospirillales. As my supervisor always points out, we cannot ever infer any function of an organism based solely on it`s 16S rRNA. Hopefully with yours and others criticisms the researchers will go back a provide stronger evidence for their claims. I'd just like to make a clarification - why did Dr Redfield suggest to use standard E Coli in the end of the article? Is this to have some kind of control group to verify the methodology? Wouldn't standard E Coli simply die when they are put in an arsenic solution? I'm a bit of a layman, so please forgive my ignorance. I really like your post, but I have some questions. You say, "I suspect most of the continuing growth was just compensating for cell death. It would be interesting to test whether the cells were scavenging phosphate from their dead siblings." I think by this you are saying that the phosphate from the dead cells increases the available phosphate concentration in the media for those few cells that survived, and possibly because of this, they observe more robust cell growth under the +As/-P condition than in the -As/-P condition. I'm really not an expert by any means; I'm an undergraduate who studies molecular cellular biology and has limited research experience in microbiology. But I am curious if you have good reason to believe that the phosphate from dead cells is present in a high enough concentration that could explain why the growth observed in the +As/-P condition is higher than what they observed under the -As/-P condition. Also, regarding the EXAFS data they presented in the paper, they showed that As had a similar chemical environment to P as it exists in the DNA backbone, suggesting that a substitution had occurred. I had never even heard of EXAFS before reading this paper, but I inferred that they obtained this data due to the presence of compounds in the cell that contained As, although they don't really show that these compounds were DNA or RNA specifically. My question is, what's another plausible explanation for the data they obtained? If arsenic was not in the DNA, where else could it have been where it would have had this chemical environment? I agree that this paper definitely didn't have enough evidence for them to have made such claims and created the hype that they did, and maybe you're right in saying that they didn't even have enough to make it into the journal in the first place. However, when I read the paper and looked at the data myself, it seemed like they had provided pretty compelling evidence (preliminary in nature, and not what I was expecting, but still interesting and worthwhile in my opinion)... so I just wanted to know if there was something I was missing or should take another look at before I go getting my hopes up that (despite all the criticism) there remains a good chance that GFAJ-1 does incorporate As. Like I said, I don't really have a great background in research, and when I read papers I think I tend to put too much faith in journals to publish only the highest quality material. Also, as a side note, I think they did do a purification of the gel extract before NanoSIMS. identify As in extracted, gel purified genomic DNA (Fig. 2A). As and low P relative to DNA from the -As/+P cells." Thanks for posting this! It made me think about the experiments a more and I learned a lot from doing that. I'm really not an expert by any means; I'm an undergraduate who studies biology and has limited research experience in microbiology. But I am curious if you have good reason to believe that the phosphate from dead cells is present in a high enough concentration that could explain why the growth observed in the +As/-P condition is higher than what they observed under the -As/-P condition. I agree that this paper definitely didn't have enough evidence for them to have made such claims and created the hype that they did, and maybe you're right in saying that they didn't have even enough to make it into the journal in the first place. However, when I read the paper and looked at the data myself, it seemed like they had provided pretty compelling evidence (preliminary in nature, and not what I was expecting, but still interesting and worthwhile in my opinion)... so I just wanted to know if there was something I was missing or should take another look at before I go getting my hopes up that (despite all the criticism) there remains a good chance that GFAJ-1 does incorporate As. Like I said, I don't have a great background in research, and when i read papers I think I tend to have too much faith that journals publish only the highest-quality material they get. Also, as a side note, I think they did do a purification of the gel extract. Thanks for posting this! it made me think about the experiments more, and I learned a lot. We should not reduce ourselves to insulting our fellow scientists with accusations of false motives. Instead, we should work together and support one another if we feel errors have been made. And more importantly, conclude with actual scientific fact. I've read through all the comments and no one has mentioned the nucleotide sequencing experiments. I may be a bit naive here, but would standard DNA sequencing methods be able to read a deoxyribose-As backbone template? The paper sequenced rDNA genes and didn't have any problems? The DNA sequenced just fine? On another note, I was a post-doc with Rosie and I always found her to be a person who always sought the truth. She has always been a critical thinker about all scientific issues. I think that her critical evaluation of the arsenic bacteria is no different that any other science she has been skeptical. This is who she is. Should blogs on the internet be part of the scientific discourse? Absolutely. Ask the American government if Wikileaks has had any effect on foreign policy. Magnificant observation! Thanks Rosie, I was literally excited at first to hear "the news" was actually right! Well physics has been corrupt this way for a long time (string theory, big bang religion, black hole obsession) - nice to see the biology team has a few stinkers too. For me, the most compelling data is the growth experiment done (Fig 1A). There are some critical controls missing though - they've quantified the phosphate in their growth medium (a number that seems to be large enough!) but I'm guessing they did not quantify the phosphate in their arsenate stock solution. This would explain the increased growth they saw going from low levels of arsenate up to 40 mM. The authors mention that growth in 40 mM arsenate was better than in 80 mM arsenate - this could just be the toxicity catching up (80 mM is a TON!). Good microbiologists are taught that growth must be plotted on a semi-log scale. Bacteria grow exponentially after all. OD680 seems like a strange wavelength to monitor - I believe this increases the sensitivity over monitoring cultures at OD600. As scientists we must be our own harshest critics - we know our own data better than anyone else. The tone taken by Dr. Wolfe-Simon in the NASA TV interview felt like she was trying to sell me something, rather than explain the data and how they were consistent with a hypothesis. The NASA animation was just over-the-top. It was especially off-putting to me how she hinted that she knows more than she is letting on, but wouldn't say anything. Is science a big secret that cannot be discussed until some kind of celebration / extravaganza / circus is held?! I guess she has her next Science paper all planned out and doesn't want someone to steal her idea(s)? I think the findings are very interesting even though you make some good points. You still haven't explained why the microbe thrived as more arsenic entered the environment. This makes no sense if this microbe was a phosphorus backed microbe. How can a P-backed microbe feed and thrive off of arsenic when it's being deprived of phosphorus at the same time? The thing that's troubling is why didn't the DNA hydrolyze in water if it's arsenic based. I'm starting to think this may be a case of Panspermia and this microbe needs to be studied more. The only thing I can think of is this microbe is some sort of a hybrid that evolved outside of earth in a place that had similar conditions to Mono Lake. Again, how can P-backed DNA thrive and grow in arsenic? Excellent analysis on the paper. I haven't yet found the time to properly dig through it but I am shocked already to find that they used such trivial and crude purification methods in MS. Surely they must realize that gel purification is horrendously dirty even using silica gel columns. I am a scientist in a completely different field, and have nothing to add to Dr. Redfield's critique of the original Science article. I do have to say, however, that I wish my field had a forum such as this for vetting and responding to published research. If we are looking for a viable alternative to the current system of peer reviewed publications, which often screens IN bad science and screens OUT good science with null findings, I think we've found it. In just a few days, we have achieved a thorough critique by an expert in the field, which has in turn been reviewed and further critiqued by other experts in the same and related fields. The result is a thorough and accurate assessment of the original work. Dr. Wolfe-Simon encouraged further debate under the auspices of peer review - namely, in Science. Well, I think she got it. This blog is the essence of peer review. Plus, free spelling and grammar checking.